Alpine flowers: either you pay attention to them, or you don't. I am always amazed by the hikers who blast through a particularly lush, gorgeous flower meadow on an alpine hike. Definitely not dialed into the ephemeral beauty spread lavishly at their feet! If you don't hike in mountainous areas, but crave some time with alpine flowers, there are many resources to give you stunning photos and encyclopedic knowledge of their names and habitats. 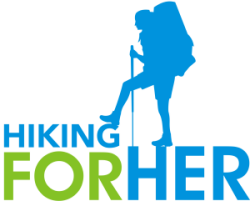 I do most of my hiking in the Pacific Northwest and Canadian Rockies, so I have a huge backlog of photos taken by my husband David Midkiff. I'd like to share with you some eye candy (i.e. alpine flowers) as well as some botany resources. Can you spot the commonalities with these plants and the plants you see and/or use every day? 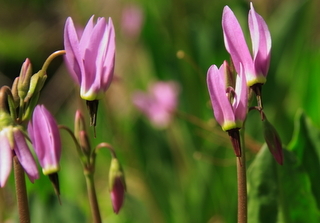 Don't these lovely alpine flowers called shooting star flowers look like they want to rocket off their stems? Here's a mini-botany lesson on this particular flower. Or you can just call it by its common name, "shooting star! Imagine an entire meadow of these flowers in a spring melt off - breathtaking! Found: Springtime in open woods, meadows; likes wet areas. Fun Fact: Prairie settlers called it "prairie pointers". 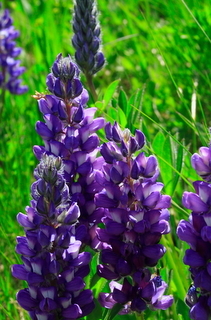 Gorgeous purple lupine means it's summertime in the mountains! Here's one of my personal favorites: lupine. It's in my flower garden at home, too - the bees go crazy for it. Fun Fact: Lupine refers to wolf. This plant was tagged with wolf like behavior in terms of how much nitrogen it took from the ground - which is wrong, because it can fix nitrogen gas from the air and put it into the soil, leaving things just a little nicer for its neighbors. Found: Midspring to midsummer in cool woods and damp openings in forests. Fun Fact: This modest little plant makes eye catching clusters of red berries (actually berry like drupes) in the fall. What a lousy name for this beautiful lousewort! At first glance this might resemble lupine, but it's called lousewort (and there are lots of different variations on the lousewort theme). Found: Varied range; in the Pacific NW I see it in mountain meadows and on dry hillsides at lower elevations. Fun Fact: "Louse" does refer to lice. Domesticated animals were reported (back in the good old days) to pick up lice when they grazed on these plants. Don't worry, you won't get lice if you crouch down to snap a photo of this pretty plant! 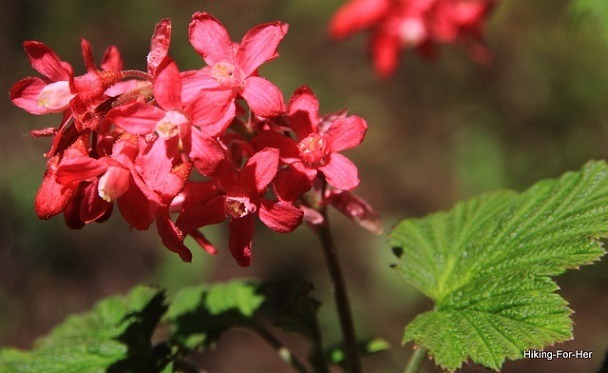 Brilliant red currants herald the arrival of spring, and the hummingbirds rejoice! I watch for these flowers in the spring, when everything else is just starting to wake up: wild currants (and yes, I do have a currant bush in my garden. Hummingbirds rely upon them in the hungry early spring months). Fun Fact: The currants produced by these flowers aren't poisonous, they just taste that way! 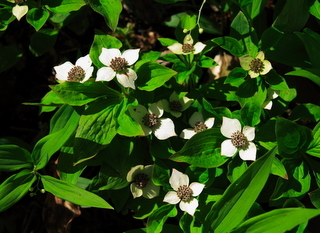 I've got lots more photos on my Pinterest page entitled Alpine Flowers of the Pacific Northwest. Check out the visual feast here. For general botany, read Botany in a Day: The Patterns Method of Plant Identification by Thomas J. Elpel. He focuses on plant families in North America. Another North American resource that I refer to frequently is the Audubon Society's Field Guide to North American Wildflowers. For the mountain flowers of western regions of the United States, here's a fantastic photo atlas. I have even more resources for you right here.